WKF President Antonio Espinós received the Japanese Order of the Rising Sun, Gold and Silver Star in Tokyo. The awarding ceremony took place Monday, November 26th at the headquarters of the Ministry of Education, Culture, Sports, Science and Technology in Tokyo. Mr Espinós was recognised for his contribution to the progress and universality of Karate, a sport with strong connections with the Japanese culture and traditions. The Order of the Rising Sun, Gold and Silver Star is one of the highest orders conferred by the Japanese government. It is granted to individuals who have made eminent achievements in international relations and in the promotion of the Japanese culture and values. “It is a great honour to be bestowed such prestigious award. 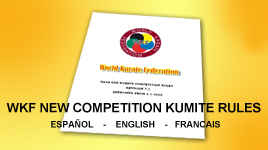 Karate is a universal sport with presence all over the world. However, we proudly try to preserve the roots of Karate and its origins going back to the Japanese traditional culture. We will continue supporting the values that we share with the Japanese culture as this Order recognises Karate’s influence in both the traditional and universal stages of our discipline. On behalf of the World Karate Federation, I am extremely grateful for this recognition,” said WKF President Antonio Espinós. The awarding ceremony had the participation of the Minister of Education, Culture, Sports, Science and Technology Masahiko Shibayama; the Commissioner of Japan Sports Agency Daichi Suzuki; the Deputy Commissioner of Japan Sports Agency Yuzuru Imazato and the Director-General of Japan Sports Agency Yoko Fujie. The WKF General Secretary Toshihisa Nagura and the president of the Japan Karate Federation Takashi Sasakawa were also in attendance among other sports and karate officials.